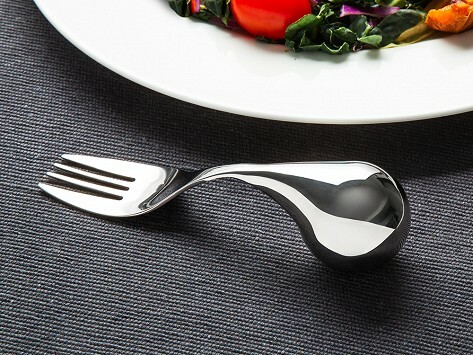 A polished-looking adaptive utensil brings a sense of dignity to those with dexterity issues who need the extra help, but don’t want to stand out. The ergonomic design feels good in the hand and is easy to maneuver, and because it’s made with stainless steel, it looks more like typical cutlery. A rounded handle is easy to pick up and a flat bottom prevents the knife, fork, or spoon from rolling out of reach. Dimensions: Fork: 5.5" x 1.5" x 1.5"; Knife: 6.5" x 1.5" x 1.5"; Spoon: 6" x 1.5" x 1.5"
Weight: Fork: 0.19 lb. ; Knife: 0.25 lb. ; Spoon: 0.25 lb. I bought the spoon for myself, largely because of its graceful shape, for its beauty and because I have trouble finding a spoon size that accommodates my somewhat small mouth while facilitating ingestion of soups and stews. Amefa’s ergonomic adaptive utensils combine function and finish while adding polish to cutlery that’s typically clunky and industrial-feeling. The pieces are made with stainless steel to blend in better with other flatware on the table and to bring a sense of dignity to those who need the extra help, like folks with dexterity issues. The utensils are weighted and shaped to feel good and fit perfectly in your hand and have a rounded handle that’s easy to pick up and maneuver. A flat bottom prevents them from rolling out of reach. This feel-good, look-good approach comes from designer Isabel Heubl, who was inspired to create a better-looking, better-functioning spoon, fork, and knife when she was still in college. Amefa, a staple in the flatware industry since 1931, made her sophisticated designs a reality.